Are you looking for bold, fresh copy for your communications? Then you’ve come to the right place. 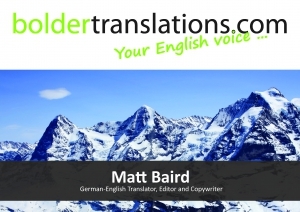 I’m Matt Baird, the Bolder Translator, and I’m an ATA Certified Translator (German-to-English). 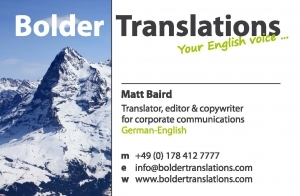 Alongside German-to-English translations, I provide English editing and copywriting services that aim to do one thing: elevate your communications. Whether you need your customer magazine translated into English, a trade journal article transformed into an engaging blog post, or captivating content for your online marketing campaign, I can help you find your English voice so that your message reaches your target audience. 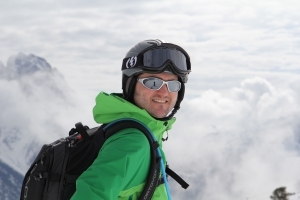 Have a look around my website, download my portfolio, and drop me a line if you like what you see.